Connects via micro USB cable or wireless pairing dongle (included with the controller). Analog dual-stage triggers (similar to the Nintendo GameCube controller's triggers). Adds full controller support to virtually any game because of Steam Input integration with high customization and being able to use XInput, keyboard and mouse inputs. Can sync configurations across computers by Steam account. Does not function as a controller when used without Steam running (shows up as an HID device). Linux users can resolve this by using the Standalone Steam Controller Driver. See Steam Client changelog and Steam Client Beta changelog for controller and controllers firmware updates. 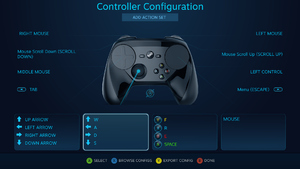 Steam Controller Database for controller configurations outside of Big Picture mode's community configs. Install/open the Steam client, go into Big Picture mode, then press the Steam button on the controller to turn it on and begin setup. Is prone to more issues than Windows and Linux. Can work standalone without Steam by using custom driver and GUI. Refer to Controller Configurator on how to configure the controller. Style of Input options in the controller configurator. Style of Input options are available for both trackpads, the analog stick, and the ABXY face buttons. Mouse - Operates as a mouse. Will control any mouse-based interface such as a cursor or in-game camera. Mouse Region - Use mouse input on a certain area on the screen; for example, moving around the minimap in a strategy game. Touch Menu - Can make a menu that appears to use certain inputs; for example, making a weapon select for a game like Doom. Scroll Wheel - Will operate as a scroll wheel. 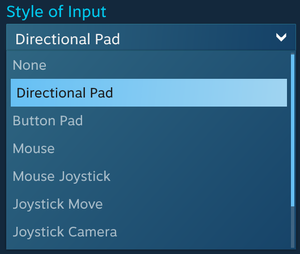 Directional Pad - Operates as a D-Pad. Any input can be assigned. Allows Diagonal pressing compared to Button Pad, but is missing Turbo options. Button Pad - Operates as a button pad. Any input can be assigned. Doesn't allow Diagonal pressing but allows Turbo buttons (repeat inputs very quickly). Joystick Move - Simulates a joystick. Intended for traditional joystick applications, like a twin-stick shooter. Joystick Camera - Intended to control a camera. Can simulate the left and right joysticks, and also a mouse. Mouse Joystick - Simulates a mouse but with joystick input. Intended for games that don't allow simultaneous mouse and controller input, like Fallout 4. 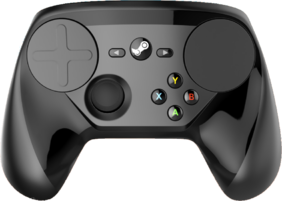 The controller should be compatible with almost every game via its Steam Input integration, although the level of support depends on the game. Refer to supported games for Steam Input for details. This is a list for games that supports the Steam Input API; the game may or may not support Steam Button Prompts natively. Refer to game-specific articles for details. For a list of games, see games with Steam Controller prompts support. This is a list for games that offer Steam Controller button prompts; the game may or may not support the Steam Input API natively. Refer to game-specific articles for details. This is a list for games with official controller bindings; the game may or may not support the Steam Input API natively. Refer to game-specific articles for details. In the Steam client, go to Settings. In the drop-down list, select NONE - Opt out of all beta programs and restart Steam. Installs itself as keyboard and mouse combo device, instead of controller and doesn't appear on Windows "Game Controllers" list. This page was last edited on 11 April 2019, at 20:52.